The Rich Food Resource Center is here to help you to take your first step towards becoming a nutrivore. As we stated in our books Naked Calories and Rich Food, Poor Food, no matter what your dietary philosophy – primal, paleo, low carb, or low fat, vegan, vegetarian or seasonal, the one thing we all have in common is the need to be micronutrient sufficient in order to stay healthy and prevent disease. The Rich Food Resource Center is designed to help you find the freshest most micronutrient Rich Food choices possible no matter where you live. It is our hope that the Rich Food Resource Center will grow to be an extensive collection of information and tools your can use each and every day to enhance your health. Below you will find our exclusive collection of Certified Rich Food Coupons, our downloadable Grocery Store Rich Food Request List and The Fab 14 and The Terrible 20 Wallet Guide. You will also find a Rich Food Locator which will help you locate farms, restaurants, farmers markets and CSAs offering raw dairy, grass fed/finished meat and much more in your local area. Additionally, we have added a small Marketplace where you can find many of the kitchen gadgets and difficult to locate Rich Foods we wrote about in Rich Food, Poor Food; and finally, don’t forget to get your Free Limited Edition Rich Food, Poor Food Shopping Tote to use on your next shopping expedition. Its all here in the Rich Food Resource Center just waiting for you right now. Make sure to explore each section below. If you have visited before, welcome back! If this is your first time here, congratulations on finding us and welcome to The Rich Food Revolution, you are about to embark on one of the most amazing and delicious adventures of your life! Enjoy. Cut Exclusive Rich Food Coupons and follow web links to save money on the Rich Foods we selected in the Steer Here Sections. Pick up a limited addition shopping tote! You’ll look smart and fashionable with your limited edition Rich Food, Poor Food shopping tote (a $9.95 value) available to you FREE*! Print the Rich Food Request List. Check off the foods that you want your local grocery store to carry, then give it your store manager. It is time to get your grocery store up to speed! Locate Local Rich Foods. Find Rich Food farms, restaurants, farmers markets, CSAs, and U-pick orchards offering raw dairy, grass-fed meat, and much more in your local area. Time to go shopping. Our marketplace is stocked with kitchen gadgets, difficult to find RICH FOODs, and books galore. Just pop into our online marketplace and away you go. Watch the Caltons in the kitchen preparing your favorite recipes from No Taste Like Home. You can create the same fantastic foods, and it is just as easy as a 5 minute video. Download a Free Fab 14 and Terrible 20 Wallet Guide. You’ll never be stuck wondering which produce is safe to buy conventionally again. Get your product certified! Are you a food manufacturer of high quality Rich Foods? Find out how to get certified today. In the interest of full disclosure… we want you to know that we received NO compensation from any of our RICH FOOD manufactures for including them in Rich Food, Poor Food or here in the Rich Food Resource Center. 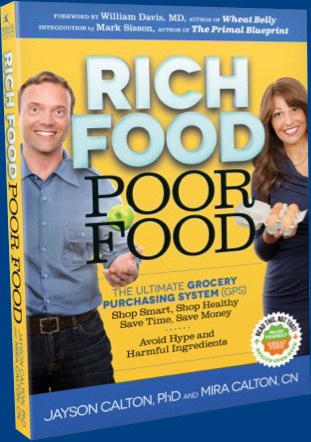 While the Rich Food Resource Center is FREE and open to everyone we do hope you will help to support the cost of running the site by purchasing a copy of Rich Food, Poor Food and officially becoming a part of The Rich Food Revolution! Remember to come back as often as you like and tell your friends about us too. And finally, please use your purchasing power to support our RICH FOOD manufactures so that they can continue their good work! * Shipping and Handling Charges do apply.